Women are gearing up for the midterms. The Democratic Party is nominating women in record numbers. Democratic women say they’re more excited to vote than any other group. And now, with news that sexual assault allegations have been made against President Trump’s Supreme Court nominee Brett Kavanaugh, the GOP might have even more reason to worry about women voters. All this might combine to drive a record gender gap — like the one we saw in 2016 — except for one thing: It may not be just women who are voting against the GOP; Republican support may be eroding among men, too. A YouGov poll this week gives us a quick snapshot of how divided women and men currently are in the battle for Congress. The poll found a 15-point gap between how men and women planned to vote on the generic ballot, which just asks if respondents are more likely to vote for a Republican or a Democrat in a House race. (Women favored Democrats by 10 points and men favored Republicans by 5 points, for a total gap of 15 points.) Two other polls released this week reported smaller gaps: A Morning Consult poll found a 5-point difference between women and men, and an Ipsos poll found just a 3-point difference. It’s difficult to paint a complete picture using just three polls, so we analyzed all the September polls we’ve collected where voting patterns are broken down by gender. We found anywhere from a 3-point to a 34-point gender gap in the 12 polls we analyzed, and in every case, women were more Democratic-leaning than men; on average, the gap was 16.5 points. With a range this wide, the gender gap could be notably smaller or bigger than it was in 2016. If it falls into the lower end of our range (around 3 points), Republicans will still have reason to worry because a gap that small might mean that more men moved to the left, rather than that more women shifted to the right. On average so far this month, men supported the Republican candidate over the Democratic candidate 44 percent to 43 percent — a difference of just 1 point. If that is ultimately reflected in the polls, it will represent a notable shift from 2014, when men voted for the Republican candidate by 16 points, and from 2016, when they favored the GOP by 12 points, according to exit poll data. Women, however, look like they’ll vote just as strongly Democratic as they have in the last three elections — and perhaps even more strongly. Women said they would vote for the Democratic candidate in a generic congressional election by an average of 15 points, with nearly 50 percent preferring Democrats. That’s a bigger margin than the one by which they voted for Democrats in 2016 (+10 points), 2014 (+4 points) or 2012 (+11 points). We also took a look at the gender gap at the state level. Here are a few state polls of specific races — not the generic ballot — that were released this week and caught our eye. In the Arizona Senate race, a CNN/SSRS poll found a whopping 32-point gender gap. Men were planning to vote for Republican Martha McSally over Democrat Kristin Sinema 53 percent to 43 percent, while women planned to vote for Sinema 57 percent to 35 percent. That’s a much larger gap than 6 years ago, when Republican Jeff Flake won men by 11 points and lost women by just 1 point, according to exit polls. In the Wisconsin Gubernatorial race, 24 points separated how men and women planned to vote in a Marquette University Law School poll of likely voters. Men said they would vote for Gov. Scott Walker 49 percent to 41 percent, and women planned to vote for Democrat Tony Evers 53 percent to 37 percent. In 2014, Walker won men by 21 points and lost women by 9 points, according to exit polls. According to a Gallup poll, opposition to Supreme Court nominee Brett Kavanaugh was on the rise before it became public knowledge that he had been accused of sexual assault. Three separate polls conducted by HuffPost/YouGov on Kavanaugh’s nomination (before the allegations, after the allegations, and after the accuser came forward publicly) found no significant change in opinions. But according to a Morning Consult poll conducted after news of the allegations broke, disapproval of Kavanaugh’s confirmation ticked up 2 points compared with the last poll conducted wholly before the news broke and approval dipped down the same amount. Maryland Governor Larry Hogan had a 22-point lead against his Democratic challenger in a Goucher poll. Hogan remains a popular GOP governor in a very blue state — Hillary Clinton won the state by 26 points in 2016. Wisconsin Gov. Scott walker continues to trail Democratic challenger Tony Evers by 5 points among likely voters in a Marquette University Law School poll. Nearly half of Americans in an NPR/Marist poll believe it’s “likely” or “very likely” that not all votes will be counted in the November elections. Nonwhite voters are notably more skeptical of the election’s fairness than white voters are. Pope Francis’s favorability rating among Americans has dropped by 13 points since August in a Gallup poll that was conducted after an archbishop published claims that the pontiff had covered up the wrongdoings of a cardinal who has been accused of sexually abusing adults and children. Men are more likely than women to think that spanking is an effective form of punishing a child, according to a YouGov poll. According to our tracker, Trump has a net approval rating of -13.1 points; 40.5 percent of Americans approve of of his job performance and 53.6 percent disapprove. 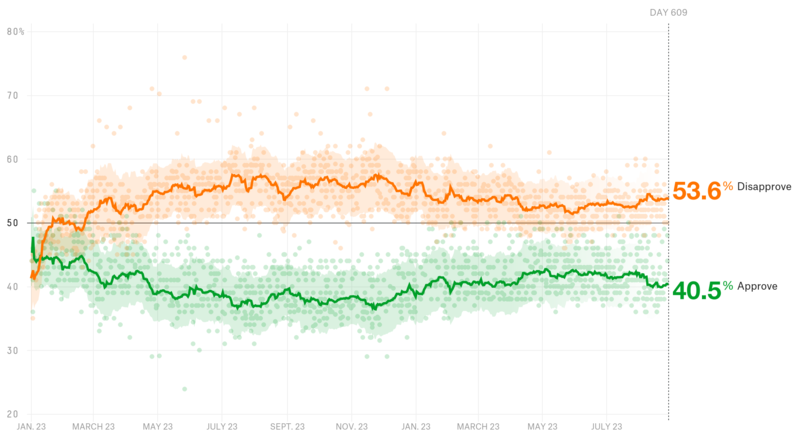 That’s about the same as one week ago, when his net approval stood at -13.8 points (39.9 percent approved and 53.7 percent disapproved). At this time last month, that net approval was slightly higher at -10 points — 42.3 percent approval, 52.3 percent disapproval. According to our tracker of generic congressional ballot polls, Democrats continue to lead Republicans in the race for the House. Democrats are ahead with 49.2 percent to 40.4 percent of the vote, good for a margin of 8.8 points. That’s pretty similar to one week ago, when Democrats led by 9.1 points (48.8 percent to 39.7 percent). 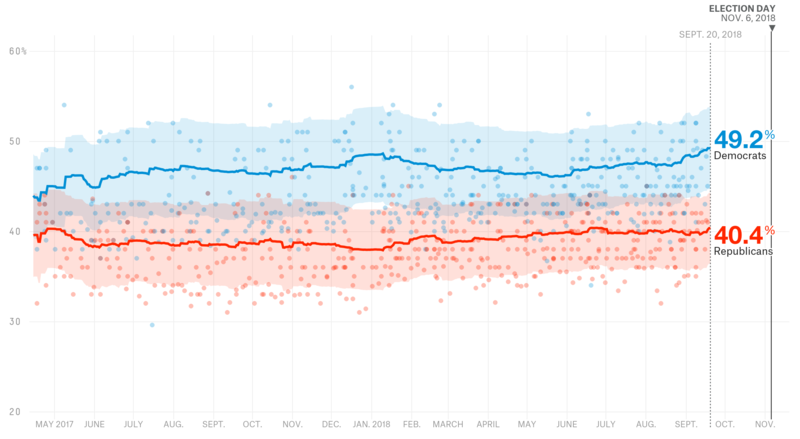 And better than one month ago when Democrats had a 7.1-point advantage, 47.3 percent to 40.2 percent.